The date has been changed to allow for greater publicity for this interesting event. In cards if a reaction physically divulges information to your opponent it is called a "tell". The use of a surprise variation or surprise move, especially a sacrifice, then gauging your opponent's reaction is fun. Once in a time scramble a nervous young opponent constantly was glancing my eyes to gauge my response to his every move; and also immediately after I completed my move. I think some people believe that a person will look the opponent's piece that they believe will gives them the most trouble when immediately completing their move. In this game I actually put on my Red Sox cap and would have put sunglasses on if I had them. are constantly laying their pencil and hand over their recent moves, comes to mind. I try to write down the time of each move made. Then when on the move analyze if the duration is out of the ordinary eg. : 15 minutes to make that one. I try to recognize pretty significant variances either shorter or longer than I expected given the position. Opponents I have faced often and sense that they are either moving faster or slower than they normally do can tell me that they are unfamiliar, familiar, might have a cook to zap me, or they look rushed. Important OTB information to better judge your opponent. Also I have the habit to always writing down the times before I get up from the board. This is based on some of the tricks people would play in the 70's when we all had analog clocks: it was alleged that some were reaching over and adjusting the clock while the opponent was away. is................let me show you...... 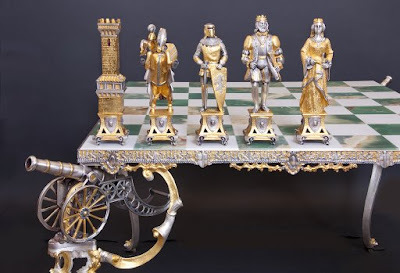 In other words in about one minute of study he absorbs all the pairings of first three rounds and anticipates outcomes to an extent that he can decide with precision what opponent lowly me will face. And what the probable opening will be. The outcome of which occurred exactly as he assumed BTW!? Pretty scary stuff. 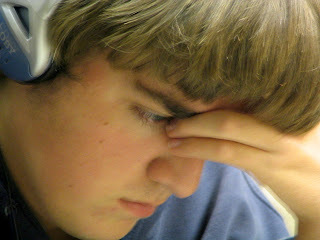 I can only imagine that he played out in his mind what each game probably of each opponent of every round looked like. Do have any stories about tells or players awareness or unawareness? Dave Vigorito, Denys Shmelov, Charles Riordan, and Paul MacIntyre will play for a $2,500 prize fund (+$2500 in charity to the Warren-Prescott Foundation) in the Galleria Florentia Tournmanet on Friday, May 1 at 1:00 pm. All are welcome to observe the games next Friday at 79 Newbury St. in Boston. When my oldest son Mike Griffin was in High School he and all his geek friends acquired CB radios (usually for a song at yard sales) for their cars so they could mobilize and change plans communicating immediately. Eventually cell phones replaced the CB need. What these kids learned was that either device allowed them to be very quick in making and executing plans. In contrast I resisted having a cell phone for many years. The kids teasingly called this crazy old man "old fashioned", but I liked the discipline required in planning and thinking through what you were going to do, and when and how you were going to communicate. This requirement gave you an opportunity to reflect about your actions and communications. So you had an opportunity to alter things before they became reality. Today, it's only when your cell phone batteries die, that you realize how your approach to things and task organization is affected by this new cell phone/blackberry reality. Sad to say my company gave me a cell phone/computer, so I can be reached 24/7. With this ball and chain I have grudgingly become a cell phone world citizen. On recent vacations out of country I have to lug an international phone to stay connected to work. It's only in the backwoods of Maine where I'm out of the e-shadow of phone towers where I can find the solitude of my earlier and simpler untethered life. And that too is going away. But I digress: I was directing one of my first tournaments one Saturday about 7 years ago, when the club was at Clarendon Street, and I noticed that many of the adolescent kids were being dropped off at the tournament by parents who were arming their children with cell phones. I thought that was a pretty good idea as it gave the kids some independence but also a life line.The bathroom was on the seventh floor below the chess club (8th floor) and could either be reached by elevator or via fire stairway assuming the door to the stairs was unlocked to the level below or (more commonly) propped open by the trash barrel that really should have been inside the bathroom. The stairway gambit was the way to go if you knew for sure that the door below was open because you didn't have to wait for the elevator to come up and get you. But if the stairway door was LOCKED you had to travel down seven flights to the bottom floor, get out to the street, reenter the building thru the lobby, and take the elevator eight floors up to the BCF, a real time waster. This stairway was unmarked so the first time you were locked in the stairway it could be disconcerting as you had to figure out it was for escaping fires thus you had to go down to the street. That Saturday then teenager Oleg Ogarkov got locked in the stairway. Sharp Oleg simply pulled out his cell phone and called me in the club. I told him to walk up the stairs and knock and I would open the door. And so it happened, problem quickly solved no long march for Oleg. FYI Oleg currently is getting an engineering degree in materials at UMass Lowell and hasn't been playing much chess. Cell phones in the chess hall are disruptive and are banned from FIDE tournaments. I asked the USCF if there are formal rules and Walter Brown of the USCF says it's up to the TD, but penalties ranging from time penalties to forfeiture are common for ringing, answering vibrating calls in the playing hall, and texting at the board. The penalties should be announced before hand and it would be good if the rules were posted. Just like in everything in life today, this instant communication option reduces the cycle time of every event/transaction/problem. In IT the fact that I have the cell phone I have learned actually decreases the time I need to put into working off hours because being part of a network actually solves problems much faster. In old IT days (when men were men and data was on cardboard) major projects required a team of specialists to camp at work together whole weekends, mostly waiting for their few occasional moments of glory to submit this or that job. A simple phone call may mean people are less apt to mess things up if they have a life line call, thus eliminating your cleanup time and loss to the company. So the fact I can be reached on a weekend by my job actually increases my chess time, most of the time. And these kids can actually play more often because parents are confident enough to leave them as long as they have a phone. And no doubt the ability being connected allows many others the opportunity to play chess. So it's a love/hate relationship with cell phones and chess. Please put your phone on vibrate and do not stand in the hall just outside the door shouting into your cell phone while the round is in session. 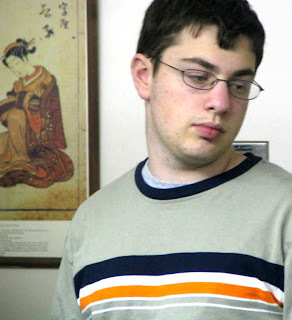 What are your feelings about chess and cell phones? Vigorito, Shmelov and Riordan qualified for the Galleria Forentia tournament. on Friday, May 1 at 1:00 pm a quads with a $2,500 prize fund. The winners of the following events qualify for a special tournament to be held at the Galleria Florentia. Tornado # 98 4SS G/65. EF: $27, $17 to BCF members. Two sections: Open & Under 1800. Prizes: b/entries. Reg: 9:15 to 9:50; Rds: 10, 12:40, 3, 5:10. Paul MacIntyre won qualified for the Galleria Florentia tournment with a 4.0 win in the Swiss #22. Many comments in a past essay prompted me to think about how opponents vary in looking you in the eye and try to get a read. Trying to pick up on the Karma of your opponent is one of the fundamental things that makes OTB/OverTheBoard chess a way cool game. Similar to card games like poker, bridge, hearts etc. Examples: Chris Williams tends to deliver bombs with a "take that" glance. Denys Shmelov is constantly sizing you and your position up. 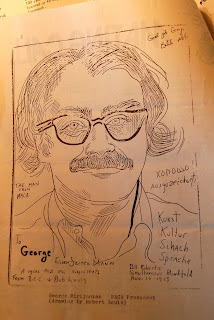 In fact I think Denys' Pythonic Prophylactic Petrosian style is so cool. Shmelov realizes what you are doing but seems to be playing a different game, on a different frequency, on the same board!? Very disconcerting to a brawler like me who knows he will be forced to wrestle instead of box. David Vigorito's eyes are moving everywhere and many times seems to be more involved in the games beside us than our game. Another thing Vigorito does is walk around the whole BCF hall and with a glance figures out what's going on at every board (the strong and weak), especially potential future opponents. In fact Vigorito will hesitate and look over any score of a position in order to understand why that particular position seems "different". Recently I lost a pawn early against Lawyer Times, and when the Vigorito fly by occurred, I could see wheels spinning: "This is odd, why?". No wonder he's the President of the BCF. I bet Vigorito would give a great simul. 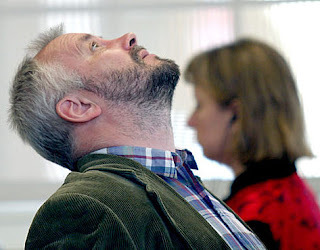 Then there are some like Alexander Ivanov where it appears only the position behind his closed eyes matters, head aimed at the ceiling, having a root canalled pained face. 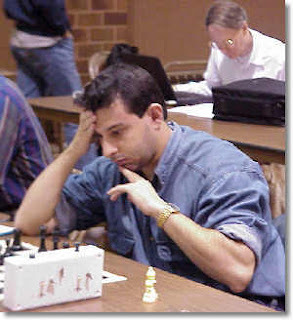 Although past blog commenters indicate that occasionally opponents'' peripheral equipment of baseball hats or non-plastic chess sets bring static to Ivanov's Karma. So some of these GM/IM/Masters have a super consciousness about what is going on with every aspect of the whole tournament which to us average players boarders on the surreal. Sometime in the future I'll give other examples of this concerning Jacob Rasin and Bobby Fischer. So while we plebeians* are straining to read one person there are people like Vigiitto who labor every second, use every sense, read everything, in fighting to get the tournament edge. We are all self absorbed when competing in a tournament, but each of us casts our net to varying distances and directions to gather information as to what is going on. OTB is all about the sensations and excitement. You can't get those inputs and feelings playing on the internet. In fact my experience is that anything greater than a "thank you" or "good game" via Internet is usually something stupid. What are some of you experiences concerning eyeball to eyeball chess? Ten-year-old Mika Andrew Brattain, a Class A-rated player from Lexington, Massachusetts, won the K-5 Championship of the Super Nationals IV tournament on Sunday, April 5, in Nashville, Tennessee. The Harrington Elementary School fifth-grader chalked up a score of 6.5-0.5 in a field of 317 players to finish first on tiebreak points over provisionally rated Class C player Ford Yukio Nakagawa of Hawaii. Mika defeated in the final round front-runner Christopher Wu of New Jersey, who finished with a 6-1 tally. Mika attained his Class A rating with the March 2008 USCF rating supplement - more than five months before his 10th birthday. 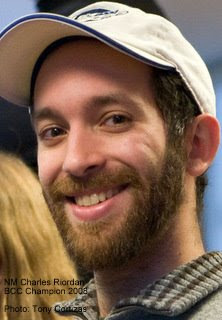 He has been playing rated chess since December 19, 2004, when he competed at age 6 in a Burger King tournament in Waltham, Mass., directed by the late Gus Gosselin. The Boylston Chess Foundation's educational division, nutrition branch, seems to have advanced beyond FM Mike Klein's recent Chess Life article. Brilliantly simple, the Boylston Chess Diet [aka the Griffin-Ho Diet] addresses the need for a balance of protein, carbs, and hydration. However, this may not be the final formulation. I move that the board debate the issue in a sloth of emails until Heraclitus says stop. We will then vote, using Minnesota rules. In his fine book, Practical Endgame Play - beyond the basics, Glenn Flear touches on the topic of the bathroom and chess (p. 383, NQE 15-17). I suppose you might say that Topalov more than touched on that in his 2006 match with Kramnik. I'd say it's fair game for a blog entry. In round 4 of the ongoing ten round Paramount tournament, I had Black against Jon Lee, who was the sole leader in our six person section at 3-0. During play, I ingested a large sloth of Gummi bears in my efforts to help ward off a potential Jon Lee "10-0" train. As the first time control (40 moves in 2 hours) approached, I found myself in some time pressure (a "Dog Bites Man" news headline). Minutes lost for a bathroom break would certainly have endangered my search for a winning line. 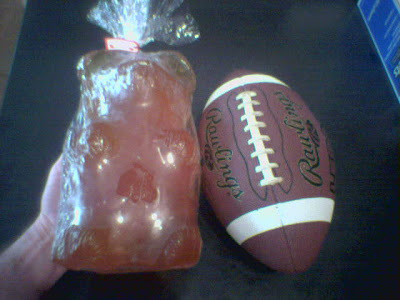 Thanks to the Gummi bears, however, I did not have to visit the bathroom during the game, and I brought home the point (well, the monstrous f4 knight below helped, too). In round 5, Harold Dondis as Black outplayed me and achieved a better game (=+, I'd say). I hoped he wasn't on track to add to his 2-0 score against me from the mid-90's, building up nemesis status. He made that move just before leaving the room -- leaving, in all likelihood, to go to the bathroom. I replied 17 b4! 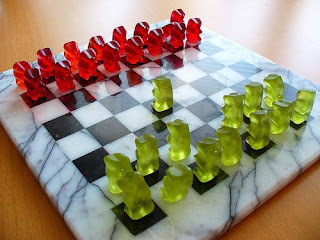 winning at least a pawn. 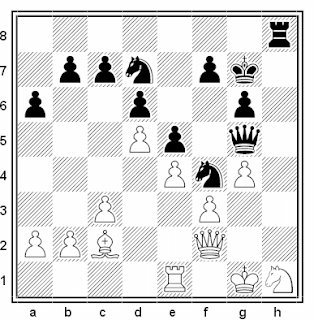 However, Harold missed the threat and played 17...cxb4? ?, landing in a most grizzly situation after 18 Qxc8! winning his bishop for my b-pawn (18...Rxc8 19 Rxc8+ winning back the queen). 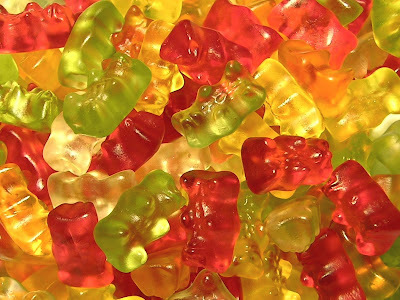 Try some Gummi bears next game -- they're Ursa Majorly delicious! P.S. to Mike Griffin: You're right, I do win some games...but just bearly. New Years Day at the BCF is marked with the Herb Healy Open House Tournament. It is a who's who of Boston Chess where many chess players show up to play in a tradition after their Eve's revelry. 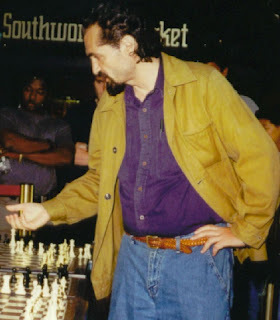 Often GM Larry Christiansen is the strongest player with a field filled with IM's, masters, players of all strengths, all the chess junkies show up. There is a rated and unrated section so people who partied a little too much don't have to risk their rating points. 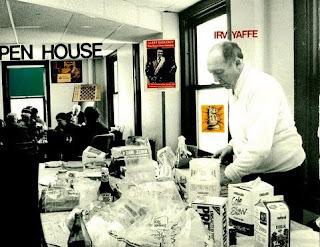 For years Irving Yaffe catered the affair with a mixture of food of which a huge roast beef was the keystone and hotdogs were popular. In days of the Blue Laws and before MacDonald's and Burger Kings most businesses were closed New Years day so food was difficult to get, thus the self catering requirement. Currently Bernado Iglesias and myself act as quartermasters and buy the food several days before the event and order fresh baked rolls due on New Year's eve. 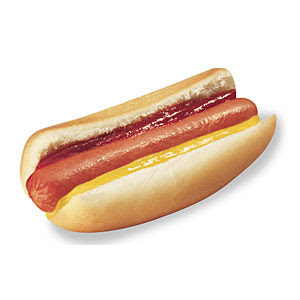 Strategic component is the Kayem Natural Casing hot dog. 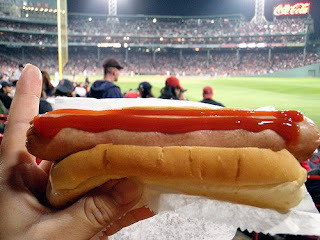 I worked at Fenway Park from 1968 to 1975 and once steamed 4000 hot dogs in 1968 in a day-night double header against Detroit, a personal best. 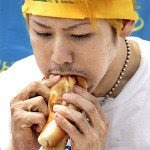 At that time I got too familiar with hot dogs and after several years of cooking dogs I stopped eating hot dogs for about 20 years. Only to have the urge one day at Sullivan's at Castle Island in South Boston and began my love affair with the Kayem. Chris Williams is above far the Hot Dog King at the Herb Healy; he has been challenged for many years but he always leads in hot dogs consumed by the end of the day. Now Kayem has pulled off a coup and obtained the official hot dog of Fenway Park. This is a new special hot dog that I will check out as soon as I can. They debut opening day on April 6 (if there is no rain) and I ask that you chess junkies please check out the new hot dog out and then provide the BCF feedback. 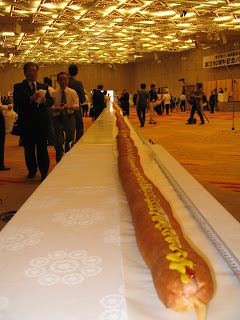 Chris and folks how do you like the new hot dog? Face When my kids were young and we were camping the kids loved to play poker in the evening. When 4 and 5 years old, my youngest Marc Griffin would giggle when dealt a good hand. I would say "keep your poker face!" and a horrible grimace would appear. Sometimes the most important thing a player has to do during a game is to keep our poker face. I can remember two games where this happened to me (as mentioned in my blunders essay): The late George O'Rourke and I had a late Friday night game and about hour five I was staring at his mate in about 7 moves. Sitting there Poker Face.....Poker Face. George was preoccupied with the queen side and missed it. I went on to win the game about hour six (about 1am.). BTW this was the last multi-day tournament that I ever commuted to, having missed my exit on the expressway driving home in the wee hours. Subsequently my wife makes me rent a room (advice: don't tell your SO about these things it will only make them worry). 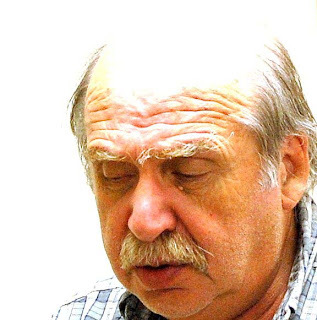 And in a game against my nemesis Mikhail Derazhne I had to sit there while he passed over a forced mate in about five. Later I went on to win the game. The situation where you realize you are in a lost position, but your opponent does not realize the fact, happens more often in games where a much stronger player is playing a weaker player. The stronger knows he messed up but the weaker player is oblivious to the fact. There have been times when I have been playing stronger players and if they take an inordinate amount of time, and I know I'm not in any type of danger, I take a real good look because sometimes it's my strong opponent who is trying to repair their position. Conversely: If you happen to be the stronger player and mess up, and your opponent doesn't realize it, often the dynamics in the position are there for you to win are greater because you haven't been punished, especially in the opening. This unbalanced in ability situation is very similar to a human playing a computer where the human unknowingly has a winning position. Because the computer's "chess horizon" is much further and deeper than that of the human, the only way it manifests itself to the human is when the computer starts sacrificing material to stop a combination the human hasn't figured out. It's an interesting phenomenon to experience. Fortunately you don't have to worry about keeping you poker face when playing a computer. And I always turn the wiseguy type remarks off as I hate being teased by personified machines. Kind of aggravating like the elevator in Douglas Adam's Hitchhiker's Guide to the Galaxy. 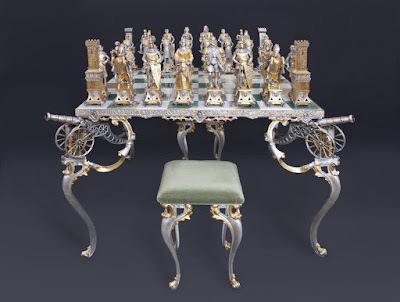 Do you have poker face or chess computer stories? I have a terrible poker face. I'm convinced my opponent can always tell what I'm thinking. For a while I took to wearing a baseball cap, pulling it way down to hide my expression. Needless to say my results went up dramatically. However... There was this one time at the NY Open, Dzindzi got so upset with me that he waved his hand across the board as if to say "get that hat out of my way". And it was my turn to move! 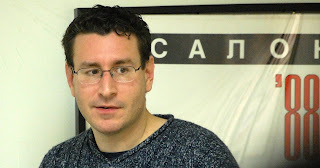 The other incident was some CCA event when Alexander Ivanov started making faces at me over the board. I was mortified, put the hat away (maybe I waited 'til the end of the tournament, I don't really remember), and haven't used one since.Here's a couple Jason didn't mention. (Sorry I don't have any catchy labels for these. 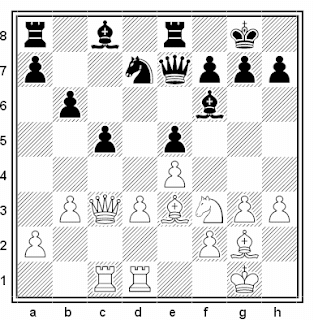 )(4) When your opponent makes a move, thinks for a second, and then gets up suddenly -- look for a blunder. He is probably leaving the board so as not to "give away" the mistake. 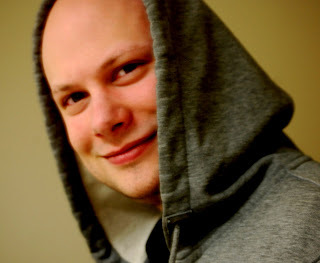 (5) If your opponent is bald, watch the top of his head. It will glow like a lightbulb when he realizes he made a blunder.